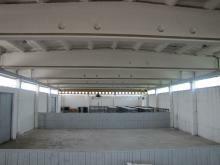 Open area with gantry crane (area 3200m2) is located on the territory ideal for storing bulky goods and temporary storage of any necessary materials. Also there are weights (max 10 tons). On territory of the enterprise there are two parking areas for trucks and cars. Parking area is under video surveillance and well secured. New comfortable offices make it possible to place your company in the green belt in two kilometers from the city and on the low-rent. It's a convenient and very effective investment. Buildings owned by the company with ramp and crane beams can be leased or offered as a storage for cargo companies at very favorable lease terms. Round the clock security and CCTV / Alarms support sufficient safety for your cargo. Tyre - the most demanded and the most necessary type of repairs on the roads in our country. It can't be done without special mounting equipment provide accurate wheel balancing. Our company offers you high quality and fast tyre. 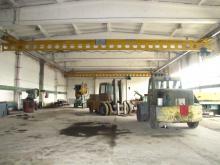 Station with observation pits and crane beams offers our clients a wide range of services related to repairs, maintenance and diagnostics of trucks. Motel is located on the first floor of an entry. It is designed for 26 people and includes 7 double and 4 triple rooms. In the motel there is a satellite TV and internet. Near the motel the parking is located. Motel is owned by the company and is located in a quiet green area, which allows a good rest while traveling. Cafe for 30 people at the motel offers a variety of nutritious foods and fast qualified service. At any time cafe greets visitors with delicious dishes and warm friendly atmosphere. Near the cafe there is an open-air court under umbrellas for the comfort of visitors in the warmer months. Our car wash for trucks offers a full specter of care services for the look of your vehicle. For carrier companies and private clients there is a wide range of specialized vehicles for various needs available: loaders, tractors (HTZ-1702 "Deutch", MTZ-82 with blade and brushes for cleaning), fuel truck, crane beams and metal station. Round the clock security, video control, lighting, proper water supply from wells, own sewage pumping station, supply from own transformer substation, natural gas of high and low pressure - all that is provided almost independently from the external suppliers. Gas station can save fuel in the tanks for transport companies (small wholesale).